PG 15. Parental Guidance. Suitable only for persons of 15 years and over. Not to be supplied to any person below that age. This is an Eros Entertainment brand of the Hindi DVD. Has no UPC Code. 155 minutes Color. Dolby Digital 4 Channel Sound. NTSC FORMAT. HAS ENGLISH SUBTITLES. Produced by: Suresh Bokadia. Directed by: K. C. Bokadia. Music: Channi Singh. 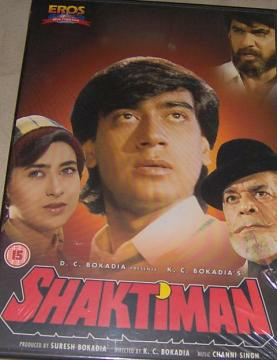 Starring: Ajay Devgan, Karishma Kapoor, Gulshan Grover, Mukesh Khanna, Ajit & Others. Release Date: 9 Jul 1993 (India). Businessman Rai Bahadur Laxmi Narayan lives a wealthy lifestyle in Bombay along with his wife, Lakshmi. Although they have been married for several years, they have no children. While on a trip to Simla, they get adopt their servant, Diler's son, re-name him Vicky, and bring him back home, much to the dismay of Diler's wife, Parvati. Aometime later, Lakshmi gets pregnant and re-visits Simla, meets with an accident and passes away, leaving behind a new-born son, Amar. Diler wants to kill Amar, but Parvati wants to return him to Laxmi Narayan, and runs away to Bombay. Diler informs his employer that both his wife and son have passed away and have been cremated. Diler re-locates to Bombay, follows her but is unable to locate Parvati. She does reach Bombay along with Amar but she, in turn, is unable to locate Laxmi Narayan. Years later Amar has grown up, lives with Parvati in Versova, works as a Police Inspector in Sion Police Station, and is in love with Priya, the Superintendent of Police's daughter, while Diler is a taxi-driver, and Vicky is an alcoholic and wants to wed Priya. Their lives will soon interline and become complicated with blackmail, deceit, and murder. Buy Shaktiman (DVD, 2000), sold & shipped by Movie Time Video where you can shop online for Pooja Mandir, Bajot, Gifts, Hindi Movie DVD / CD, Music Video. This Hindi Movies collection has been tagged as BQu 1 NA 19.95 ajay devgan karisma kapoor gulshan grover.